The Church of Scientology International today announced the online edition of the new, biographical overview of the life and legacy of Scientology’s Founder, L. Ron Hubbard: A Profile. The work is the all-encompassing overview of The L. Ron Hubbard Series, the monumental 16-volume hardback biographical encyclopedia released on March 13 commemorating the yearlong celebration of Mr. Hubbard’s centennial. 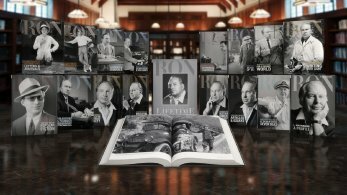 L. Ron Hubbard: A Profile is presented in its entirety at lronhubbard.org. Crowning a yearlong Centennial Celebration of Scientology Founder L. Ron Hubbard, the Church of Scientology released the monumental, 16-volume complete biographical encyclopedia, The L. Ron Hubbard Series.